Like many New England towns, my hometown of Dedham, Massachusetts, has a rich history. 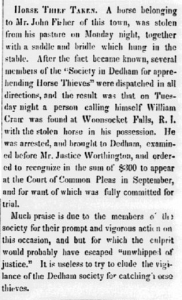 Though Dedham boasts the Fairbanks House and claims the oldest tax-supported school system in the country, I find one of the town’s most venerable societies to be particularly interesting: The Society in Dedham for Apprehending Horse Thieves. This Society was founded on 4 June 1810 after a string of horse thefts in the town. Before the establishment of a police force, thirty-five men created their own group in hopes of curbing horse theft in the area. The Society would appoint a select group of men to serve as riders for one year, and were called upon when a horse was stolen. The group was successful in apprehending thieves, such as William Crane in 1835, and spawned other societies in surrounding towns. However, membership dwindled throughout the nineteenth century, until a Dr. Edward Knobel began fundraising for the society in 1899 and reignited interest. 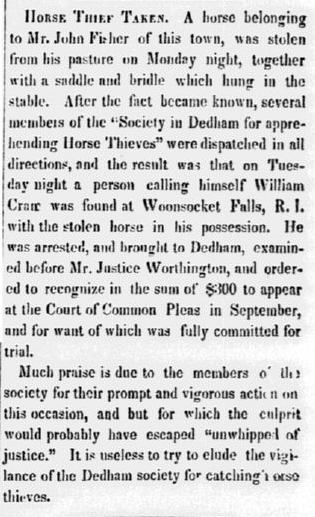 The group has changed over the years; though still in existence, the Society in Dedham for Apprehending Horse Thieves has not been involved in a theft since 1909, and functions largely as a social group. Membership gradually expanded from Dedham residents to anyone who applies or is nominated, even if they are unaware of their nomination. Notable members of the society include President John F. Kennedy, Pope John Paul II, Mikhail Gorbachev, and Supreme Court justice Louis D. Brandeis. Local clubs and societies can be a great way to learn additional information about your ancestors. For example, on our website, we have a database called Massachusetts: Grand Lodge of Masons Membership Cards, 1733-1990. 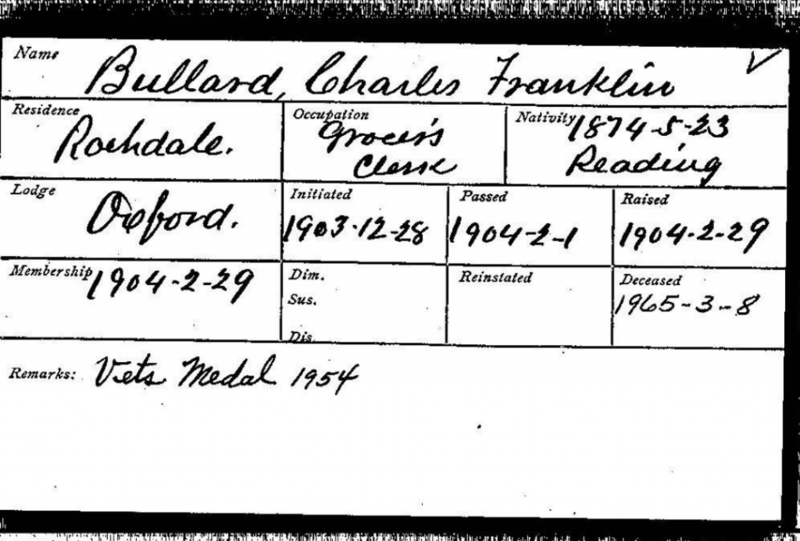 These membership cards contain a wealth of information on Massachusetts Masons, including birthplace, occupation, and membership date. Contacting local historical societies and town organizations may lead to record collections you never would have thought to look at. 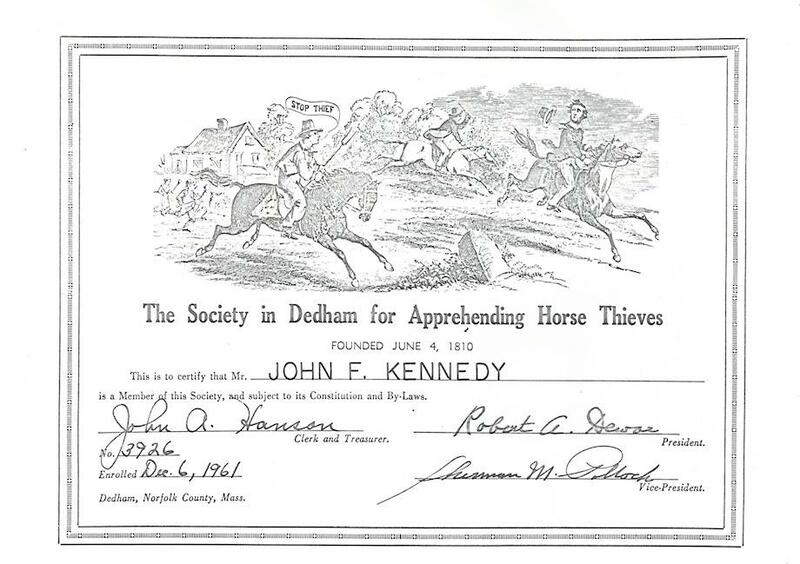 Records for the Society in Dedham for Apprehending Horse Thieves are still in existence, and more information about the society can be found on their website. Katrina, thank you for this posting. I have had one of those certificates hanging on my wall for years and we all thought it was probably some sort of prank or joke. So nice to find out the real story behind it! Our certificate was issued to Henry E. Weatherbee in Dec. 13, 1901 and is numbered 529. Thanks again for solving this mystery! What fu to read this. My ancestors include at least 8 of the Signers of the Dedham Covenan. The Lockridge book is a tattered reference on my shelf. Thank You. My Weatherbee ancestors came to Canada by way of Dedham in 1760. I seldom see the name Weatherbee in print so I was very excited to see this notation. Thank you whether this is an ancestor or a coincidence in sparked my enthusiasm to continue searching.